Loftis @ CHOW Dr. Derek Loftis of VIMS takes part in the Emerging Leaders roundtable discussion during Capitol Hill Ocean Week in Washington, D.C. © Brendan Kownacki. Dr. Derek Loftis of William & Mary’s Virginia Institute of Marine Science was recognized by a pair of national organizations this week in Washington, D.C. for his part in collaborative efforts to make Hampton Roads more resilient to flooding from storm surge, tides, and rain. VIMS' 2013 report to the General Assembly shows that recurrent coastal flooding is already a notable issue in the region, and predicts it will significantly worsen over the next 20-50 years as sea level rises an additional 1.5 feet. On Tuesday, Loftis took part in Capitol Hill Ocean Week as one of five “Emerging Leaders” invited to a roundtable discussion hosted by the National Marine Sanctuary Foundation. He used the occasion to discuss how his work can provide new ways to make flood forecasts and real-time observations more readily accessible to citizens and communities. 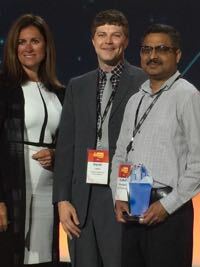 On Wednesday, he took the stage during the Amazon Public Sector Summit as a member of Virginia Beach’s winning entry in the Best Practices Award competition for localities with populations exceeding 250,000. The award—one of 3 top prizes in a pool of 13 finalists—is part of Amazon Web Services’ City on a Cloud Innovation Challenge, which recognizes and supports internet-based efforts that make it easier for governments to deliver services to citizens. Loftis, an Assistant Research Scientist who earned his doctoral degree from W&M’s School of Marine Science in 2014, says, "It was a true privilege to be included in the emerging leaders discussion. I owe an awful lot of my leadership growth to the mentorship I received from my professors and colleagues at VIMS." Regarding the Amazon award, Loftis says, “their support will contribute to community resilience and help Hampton Roads become a smarter region.” The award provides $50,000 worth of access to the company’s high-capacity web servers, allowing Virginia Beach to obtain real-time observations and stream live forecasts during major flood events while not bogging down its own everyday websites. VIMS can also use the data to inform its Tidewatch network, and validate its storm-surge modeling efforts. Loftis’s work is broadly collaborative, including his association with the newly formed Commonwealth Center for Recurrent Flooding Resiliency. A partnership between VIMS, the Virginia Coastal Policy Center at William & Mary Law School, and Old Dominion University, the Center’s goal is to provide a one-stop shop where state agencies, localities, and other entities can access the scientific and technical resources needed to help them become more resilient to flood impacts. As an example, he cites a $75,000 grant from the National Institute of Standards and Technology, which Loftis and a team of local communities received in 2016 to install water-level sensors from bridges in and around Newport News. The sensors report water levels in near real-time for use by emergency managers and the public, while Loftis and colleagues can use the readings to help refine an extremely high-resolution computer flood model being developed at VIMS under the leadership of professors Harry Wang and David Forrest. 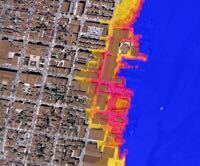 “The Center affords me and my colleagues in the regional StormSense project a unique opportunity to directly engage with decision makers, city planners, and emergency managers in order to develop useful flood modeling tools," says Loftis. 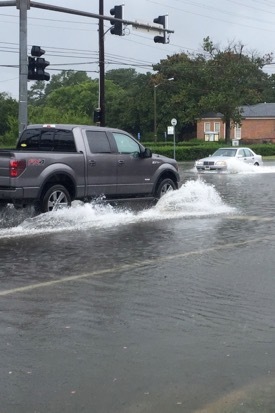 The long-term goal for Loftis and colleagues is to deploy water-level sensors across coastal Virginia, then to combine readings from these devices with data from rain gauges and other weather instruments to help inform and verify predictions from VIMS’ street-level flood model. Also of value in this regard is modeling work accomplished by Dr. Joseph Zhang in the Center for Coastal Resources Management at VIMS. Many of the complex inputs to VIMS street-level flood model can be inferred by coupling them with outputs from the open-source SCHISM model he has developed. “Ultimately,” says Loftis, “these improvements in cloud technologies and model forecasts will aid not just Virginia Beach and Hampton Roads, but the whole state through the Commonwealth Center. They’ll pave the way toward a more streamlined and automated approach to flood monitoring and predictive modeling, now and in the future."